August has been a month of Grown-up cakes. Cakes for Adults are always a fantastic creative challenge. Everything is posiible. For example I've made a Pinball Machine cake, Bowl of Salad and Bowl of Chips cakes, the Bathtub from 'Scarface', and one of my favourites- three Flying Pigeons (like the flying ducks circa 1950)! This last weekend I was commissioned for two unique cakes. 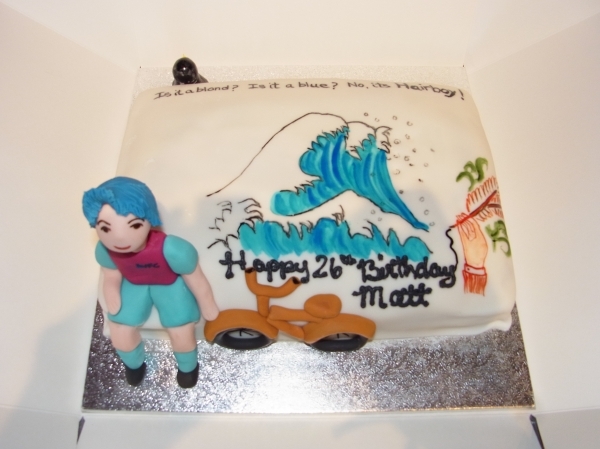 The first cake was based on a cartoon of the Birthday Boy (age 26) drawn by a friend. The cartoon was called, 'Hairboy' as the Birthday Boy has blue hair! I was also given a list of Hairboy's favourite things; his bronze coloured bicycle, his football team, his favourite band, his tattoo and his favourite animal to work into the design. The end result was a one-of-a-kind, personalized, unforgetable cake! A perfect example of what Cake Dreams does best! My second commission was a 50th birthday cake for a psychoanalyst. 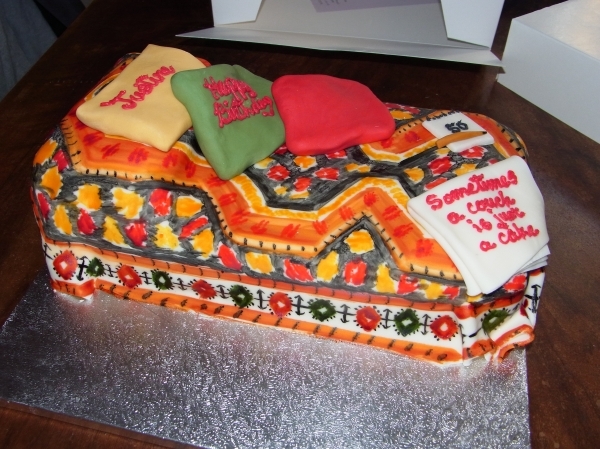 What else could it be but a Sigmund Freud's Couch cake! I always love it when someone calls to order a cake and the first thing they ask is "I don't know if you can make this...". Then I know its going to be fun challenge. Freud's couch is not just an average couch but a well worn tapestry and cushion strewn couch. The client asked for the cake to read "sometimes a couch is just a cake!". With fun and unique ideas from clients like these Cake Dreams works at its best!